Even if you’re lucky enough to work at one of the best companies for women, what are the best jobs within that company? After all, culture and the quality of work and life can really depend on your manager and specific department. In fact, nearly a third of the women in the Fairygodboss community say that their department culture and specific manager impact their day-to-day happiness. That’s why we’ve put together a list of the top 10 job titles and departments for women based on their overall job satisfaction. Women reviewing their employers on our site rated their job satisfaction on a scale of 1-5 (with 5 being the highest) and we averaged all these women’s responses when it came to those working in the same departments or sharing the same job titles. While many things can make someone happy or unhappy at work, these correlations may be helpful when it comes to helping someone plan their career, make a career change, or simply decide whether a certain new role is likely going to translate into greater happiness at work. 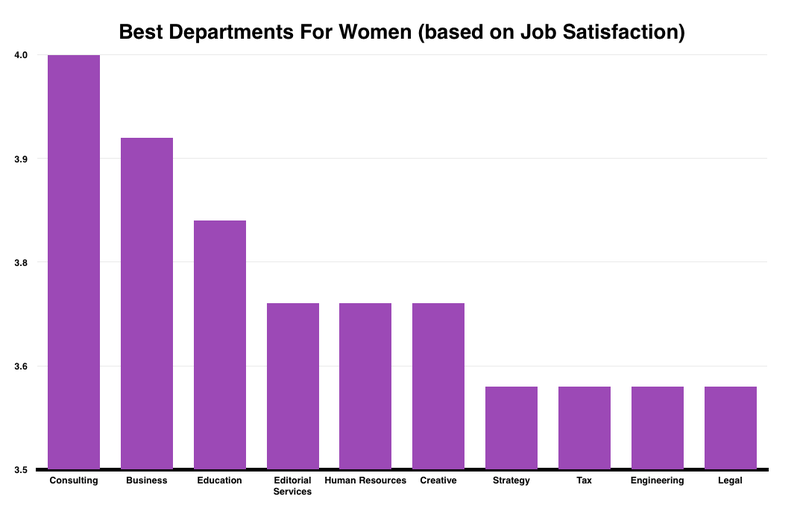 We’re quite heartened to see that certain male-dominated departments rank well in terms of women’s job satisfaction. Even though business, tax, and engineering are traditionally male-dominated departments, this shows that women can still be very happy working in them. Relatedly, among the top job titles for women in terms of job satisfaction, women in a wide range of seniorities appear to enjoy their positions. From analysts and project coordinators to Managing Directors, women report being happy in their roles. This is even true of those job titles where women are clearly in the minority (e.g. a Senior Product Manager).